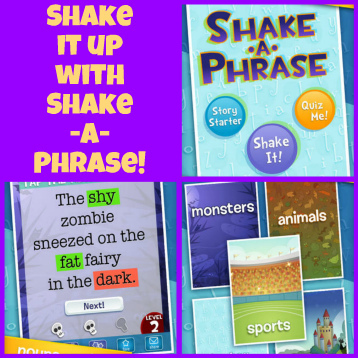 If you're looking for an inexpensive iPad app for primary-aged kids, one that has opportunities for learning and creating, check out Shake-a-Phrase: Fun with Words and Sentences. What I liked: I like apps that encourage kids to be creative. Full stop! Shake-a-Phrase encourages kids to play with words and phrases, and nudges them in the direction of talking, drawing and writing about them. Children are also involved in reading, testing their grammar skills, and imagining. Basically, Shake-a-Phrase shakes some creating out of kids and that makes me 'appy. The app provides three pathways to language learning: Shake It, where kids are presented with a random sentence and shake the iPad to produce a new one. They also have the option to tap a word to find its definition; Story Starter, a "what if" kind of prompt designed to get kids thinking and imagining; and Quiz Me, where kids are asked to find different parts of speech in sentences. Here's a sample sentence that I "shook": Near a pigsty, a dusty Santa Claus attacked the purple henchman. If kids don't like the prompt they get, they can keep shaking until they find something that makes their imaginations spark.